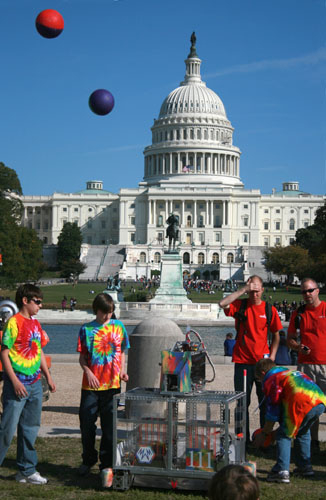 We want you to join us at the nation's largest Science Fair from Thursday, April 24th through Sunday, April 27th at the Walter E. Washington Convention Center in Washington DC! We'll be hosting special events and workshops on Thursday and Friday as well as soldering, e-sewing and programming workshops on Saturday and Sunday. Stop by! Solder a Simon or sew some LEDs in between you wandering around and checking out the rest of the exhibits. We will be holding special workshops on Thursday before the event for educators in the area and you can sign up for them here and here. We'll also be partnering with our friends at Ten80 for a robotics event on Friday that you can sign up for here. All these special events are free! Read more about the event and everything we will be up to over at the SparkFun Education Blog. We hope to see you there! That was the year I joined FIRST! I couldn't find your booth location for the Saturday and Sunday exhibits? Know where you'll be yet? Hi Dan, We're in RoboFest. See you there! Unfortunately, the links for signing up for the special workshops (events #73 and #74) don't go anywhere specific for those events. Yup. We're aware of that. Just fixed it. Thanks for the heads up!